Proprietary Name: Klor-con M What is the Proprietary Name? Non-Proprietary Name: Potassium Chloride What is the Non-Proprietary Name? Klor-con M with NDC 70518-1899 is a a human prescription drug product labeled by Remedyrepack Inc.. The generic name of Klor-con M is potassium chloride. The product's dosage form is tablet, extended release and is administered via oral form. FDA Application Number: ANDA074726 What is the FDA Application Number? ® M10 is an immediately dispersing extended-release oral dosage form of potassium chloride, USP containing 750 mg of microencapsulated potassium chloride, equivalent to 10 mEq of potassium in a tablet. ® M15 is an immediately dispersing extended-release oral dosage form of potassium chloride, USP containing 1,125 mg of microencapsulated potassium chloride, equivalent to 15 mEq of potassium in a tablet. ® M20 is an immediately dispersing extended-release oral dosage form of potassium chloride, USP containing 1,500 mg of microencapsulated potassium chloride, equivalent to 20 mEq of potassium in a tablet. These formulations are intended to slow the release of potassium so that the likelihood of a high localized concentration of potassium chloride within the gastrointestinal tract is reduced.Klor-Con M is an electrolyte replenisher. The chemical name of the active ingredient is potassium chloride, and the structural formula is KCl. Potassium chloride, USP occurs as a white, granular powder or as colorless crystals. It is odorless and has a saline taste. Its solutions are neutral to litmus. It is freely soluble in water and insoluble in alcohol.Klor-Con M is a tablet formulation (not enteric-coated or wax matrix) containing individually microencapsulated potassium chloride crystals which disperse upon tablet disintegration. In simulated gastric fluid at 37°C and in the absence of outside agitation, Klor-Con M begins disintegrating into microencapsulated crystals within seconds and completely disintegrates within one minute. The microencapsulated crystals are formulated to provide an extended-release of potassium chloride, USP.Inactive Ingredients: croscarmellose sodium, ethylcellulose and microcrystalline cellulose. The potassium ion is the principal intracellular cation of most body tissues. Potassium ions participate in a number of essential physiological processes including the maintenance of intracellular tonicity; the transmission of nerve impulses; the contraction of cardiac, skeletal, and smooth muscle; and the maintenance of normal renal function.The intracellular concentration of potassium is approximately 150 to 160 mEq per liter. The normal adult plasma concentration is 3.5 to 5 mEq per liter. An active ion transport system maintains this gradient across the plasma membrane.Potassium is a normal dietary constituent and under steady-state conditions the amount of potassium absorbed from the gastrointestinal tract is equal to the amount excreted in the urine. The usual dietary intake of potassium is 50 to 100 mEq per day.Potassium depletion will occur whenever the rate of potassium loss through renal excretion and/or loss from the gastrointestinal tract exceeds the rate of potassium intake. Such depletion usually develops as a consequence of therapy with diuretics, primary or secondary hyperaldosteronism, diabetic ketoacidosis or inadequate replacement of potassium in patients on prolonged parenteral nutrition. Depletion can develop rapidly with severe diarrhea, especially if associated with vomiting. Potassium depletion due to these causes is usually accompanied by a concomitant loss of chloride and is manifested by hypokalemia and metabolic alkalosis. Potassium depletion may produce weakness, fatigue, disturbances or cardiac rhythm (primarily ectopic beats), prominent U-waves in the electrocardiogram, and in advanced cases, flaccid paralysis and/or impaired ability to concentrate urine.If potassium depletion associated with metabolic alkalosis cannot be managed by correcting the fundamental cause of the deficiency, e.g., where the patient requires long-term diuretic therapy, supplemental potassium in the form of high-potassium food or potassium chloride may be able to restore normal potassium levels.In rare circumstances (e.g., patients with renal tubular acidosis) potassium depletion may be associated with metabolic acidosis and hyperchloremia. In such patients potassium replacement should be accomplished with potassium salts other than the chloride, such as potassium bicarbonate, potassium citrate, potassium acetate, or potassium gluconate. BECAUSE OF REPORTS OF INTESTINAL AND GASTRIC ULCERATION AND BLEEDING WITH EXTENDED-RELEASE POTASSIUM CHLORIDE PREPARATIONS, THESE DRUGS SHOULD BE RESERVED FOR THOSE PATIENTS WHO CANNOT TOLERATE OR REFUSE TO TAKE LIQUID OR EFFERVESCENT POTASSIUM PREPARATIONS OR FOR PATIENTS IN WHOM THERE IS A PROBLEM OF COMPLIANCE WITH THESE PREPARATIONS.For the treatment of patients with hypokalemia with or without metabolic alkalosis, in digitalis intoxication and in patients with hypokalemic familial periodic paralysis. If hypokalemia is the result of diuretic therapy, consideration should be given to the use of a lower dose of diuretic, which may be sufficient without leading to hypokalemia.For the prevention of hypokalemia in patients who would be at particular risk if hypokalemia were to develop, e.g., digitalized patients or patients with significant cardiac arrhythmias.The use of potassium salts in patients receiving diuretics for uncomplicated essential hypertension is often unnecessary when such patients have a normal dietary pattern and when low doses of the diuretic are used. Serum potassium should be checked periodically, however, and if hypokalemia occurs, dietary supplementation with potassium-containing foods may be adequate to control milder cases. In more severe cases, and if dose adjustment of the diuretic is ineffective or unwarranted, supplementation with potassium salts may be indicated. All solid oral dosage forms of potassium chloride are contraindicated in any patient in whom there is structural, pathological (e.g., diabetic gastroparesis), or pharmacologic (use of anticholinergic agents or other agents with anticholinergic properties at sufficient doses to exert anticholinergic effects) cause for arrest or delay in tablet passage through the gastrointestinal tract. Hypokalemia should not be treated by the concomitant administration of potassium salts and a potassium- sparing diuretic (e.g., spironolactone, triamterene, or amiloride) since the simultaneous administration of these agents can produce severe hyperkalemia. Angiotensin- converting enzyme (ACE) inhibitors (e.g., captopril, enalapril) will produce some potassium retention by inhibiting aldosterone production. Potassium supplements should be given to patients receiving ACE inhibitors only with close monitoring. Solid oral dosage forms of potassium chloride can produce ulcerative and/or stenotic lesions of the gastrointestinal tract. Based on spontaneous adverse reaction reports, enteric-coated preparations of potassium chloride are associated with an increased frequency of small bowel lesions (40 to 50 per 100,000 patient years) compared to extended-release wax matrix formulations (less than one per 100,000 patient years). Because of the lack of extensive marketing experience with microencapsulated products, a comparison between such products and wax matrix or enteric-coated products is not available. Klor- Con M is a tablet formulated to provide an extended rate of release of microencapsulated potassium chloride and thus to minimize the possibility of a high local concentration of potassium near the gastrointestinal wall.Prospective trials have been conducted in normal human volunteers in which the upper gastrointestinal tract was evaluated by endoscopic inspection before and after one week of solid oral potassium chloride therapy. The ability of this model to predict events occurring in usual clinical practice is unknown. Trials which approximated usual clinical practice did not reveal any clear differences between the wax matrix and microencapsulated dosage forms. In contrast, there was a higher incidence of gastric and duodenal lesions in subjects receiving a high dose of a wax matrix extended-release formulation under conditions which did not resemble usual or recommended clinical practice (i.e., 96 mEq per day in divided doses of potassium chloride administered to fasted patients, in the presence of an anticholinergic drug to delay gastric emptying). The upper gastrointestinal lesions observed by endoscopy were asymptomatic and were not accompanied by evidence of bleeding (Hemoccult testing). The relevance of these findings to the usual conditions (i.e., non-fasting, no anticholinergic agent, smaller doses) under which extended-release potassium chloride products are used is uncertain; epidemiologic studies have not identified an elevated risk, compared to microencapsulated products, for upper gastrointestinal lesions in patients receiving wax matrix formulations. Klor-Con M tablets should be discontinued immediately and the possibility of ulceration, obstruction, or perforation should be considered if severe vomiting, abdominal pain, distention, or gastrointestinal bleeding occurs. per se can increase the serum potassium concentration into the normal range even in the presence of a reduced total body potassium. The treatment of potassium depletion, particularly in the presence of cardiac disease, renal disease, or acidosis requires careful attention to acid-base balance and appropriate monitoring of serum electrolytes, the electrocardiogram, and the clinical status of the patient. Physicians should consider reminding the patient of the following:To take each dose with meals and with a full glass of water or other liquid. Place the whole tablet(s) in approximately one-half glass of water (4 fluid ounces).Allow approximately 2 minutes for the tablet(s) to disintegrate.Stir for about half a minute after the tablet(s) has disintegrated.Swirl the suspension and consume the entire contents of the glass immediately by drinking or by the use of a straw.Add another one fluid ounce of water, swirl, and consume immediately.Then, add an additional one fluid ounce of water, swirl, and consume immediately.Aqueous suspension of Klor-Con M extended-release tablet that is not taken immediately should be discarded. The use of other liquids for suspending Klor-Con M tablets is not recommended. in vitro hemolysis of the sample. Carcinogenicity, mutagenicity, and fertility studies in animals have not been performed.Potassium is a normal dietary constituent. Animal reproduction studies have not been conducted with Klor-Con M tablets. It is unlikely that potassium supplementation that does not lead to hyperkalemia would have an adverse effect on the fetus or would affect reproductive capacity. Clinical studies of potassium chloride did not include sufficient numbers of subjects aged 65 and over to determine whether they respond differently from younger subjects. Other reported clinical experience has not identified differences in responses between the elderly and younger patients. In general, dose selection for an elderly patient should be cautious, usually starting at the low end of the dosing range, reflecting the greater frequency of decreased hepatic, renal or cardiac function, and of concomitant disease or other drug therapy.This drug is known to be substantially excreted by the kidney, and the risk of toxic reactions to this drug may be greater in patients with impaired renal function. Because elderly patients are more likely to have decreased renal function, care should be taken in dose selection; and it may be useful to monitor renal function.
. The most common adverse reactions to oral potassium salts are nausea, vomiting, flatulence, abdominal pain/discomfort, and diarrhea. These symptoms are due to irritation of the gastrointestinal tract and are best managed by diluting the preparation further, taking the dose with meals or reducing the amount taken at one time.
. It is important to recognize that hyperkalemia is usually asymptomatic and may be manifested only by an increased serum potassium concentration (6.5 to 8.0 mEq/L) and characteristic electrocardiographic changes (peaking of T-waves, loss of P-waves, depression of S-T segment, and prolongation of the QT-interval). Late manifestations include muscle paralysis and cardiovascular collapse from cardiac arrest (9 to 12 mEq/L). Treatment measures for hyperkalemia include the following:Patients should be closely monitored for arrhythmias and electrolyte changes.Elimination of foods and medications containing potassium and of any agents with potassium-sparing properties such as potassium-sparing diuretics, ARBS, ACE inhibitors, NSAIDs, certain nutritional supplements and many others.Intravenous calcium gluconate if the patient is at no risk or low risk of developing digitalis toxicity. Intravenous administration of 300 to 500 mL/hr of 10% dextrose solution containing 10 to 20 units of crystalline insulin per 1,000 mL.Correction of acidosis, if present, with intravenous sodium bicarbonate.Use of exchange resins, hemodialysis, or peritoneal dialysis.In treating hyperkalemia, it should be recalled that in patients who have been stabilized on digitalis, too rapid a lowering of the serum potassium concentration can produce digitalis toxicity. The extended-release feature means that absorption and toxic effects may be delayed for hours. Consider standard measures to remove any unabsorbed drug. Place the whole tablet(s) in approximately one-half glass of water (4 fluid ounces).Allow approximately 2 minutes for the tablet(s) to disintegrate.Stir for about half a minute after the tablet(s) has disintegrated.Swirl the suspension and consume the entire contents of the glass immediately by drinking or by the use of a straw.Add another one fluid ounce of water, swirl, and consume immediately.Then, add an additional one fluid ounce of water, swirl, and consume immediately. Aqueous suspension of Klor-Con M extended-release tablets that is not taken immediately should be discarded. The use of other liquids for suspending Klor-Con M tablets is not recommended. 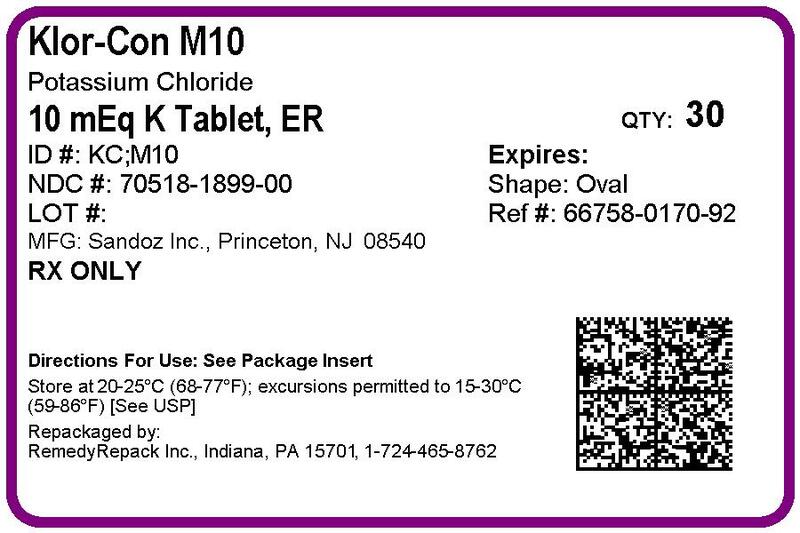 ® M10 tablets are white, oblong and imprinted "KC M10". ® M15 tablets are white, oblong, imprinted "M 15" and scored for flexibility of dosing. ® M20 tablets are white, oblong, imprinted "KC M20" and scored for flexibility of dosing. Store at 20° to 25°C (68° to 77°F); excursions permitted to 15° to 30°C (59° to 86°F) [see USP Controlled Room Temperature]. Protect from light and moisture. Dispense in tight, light-resistant container with a child-resistant closure.